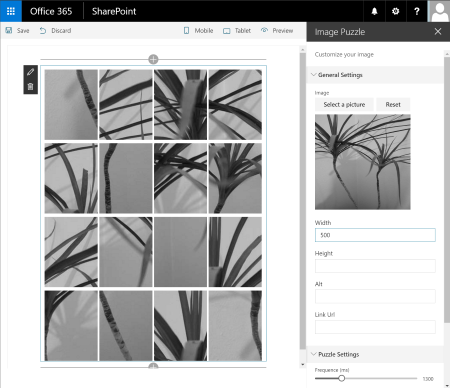 The Image Puzzle Web Part is a SharePoint client side web part built with the SharePoint Framework (SPFx). With this Web Part, you can choose a picture from SharePoint librairies, and it will automatically apply a puzzle animation. This WP uses the jquery plugin jigsaw. This web part uses also the Custom Fields library to enhance the web part edition experience.